Calling All Foodies: I Need a Plum Recipe!! Our German landlord just brought us a bucket of plums from his property. 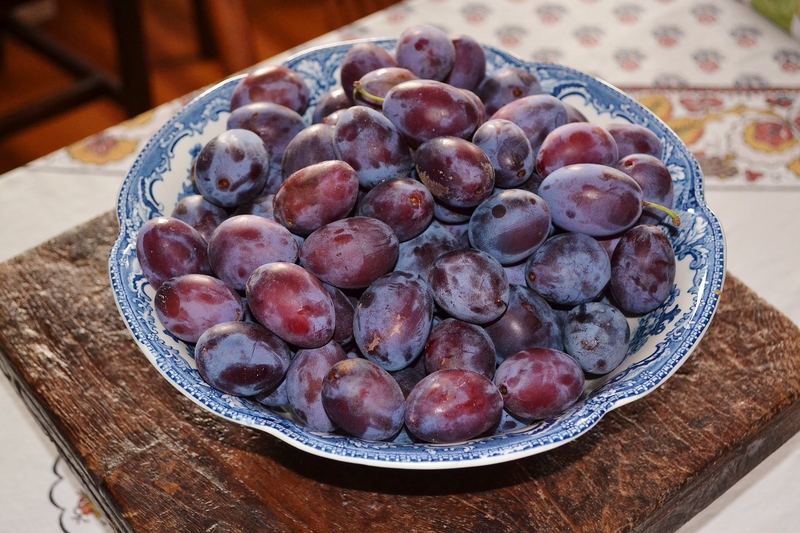 I would love to make a great plum kuchen, a tart, some jam, etc. Any favorite recipes out there? I’d love it if you’d share. This morning, I’m launching into a spiced plum jam recipe: a riff on the recipe found here http://allrecipes.co.uk/recipe/17496/spiced-plum-jam.aspx. I may fiddle with the spices and add a dash of rum. We’ll see. But I will still have half a bucket of plums left–so bring on your ideas. Any suggestions welcomed, and German recipes especially welcomed. Very good at eating Pflaumkuchen but no idea how to make one! Aged goat cheese, encrust with pistachios, drizzle with honey/maple syrup, wrap in puff pastry. Bake in the oven 180-200C for about 20-30min, or until puff pastry is golden. Cheese should be oozy. Slice, drizzle with more honey/maple syrup. Serve with olive tapenade and anchovy.